The authors present methods of calculating the chemical composition of a complex inoculant for the production of vermicular graphite iron castings. Results of making specific vermicular graphite iron castings from the product mix of OAO KAMAZ-Metallurgiya based on rapidly cooled "chips inoculants" "VERMILOY" of domestic and "Compact Mag" of foreign production are given. Effectiveness of replacing a number of gray and nodular iron castings with vermicular graphite iron from the point of view of economic and operational factors is shown. Dynin A.Y. NPP Company — 10 Years of Continuous Growth! There has been advanced a supposition about the highest effectiveness of using (as compared to other rare-earth metals) lanthanum in a magnesium inoculant to fight shrinkage defects. Front-wheel brake shoe guides were cast using an FSMg inoculant with lanthanum in pilot and experimental-industrial lots. In investigating the casting microstructure an increase in the number of spheroidal graphite inclusions and prevalence of paired fine secondary graphite inclusions over large primary graphite inclusions (bimodality) was found, which is the main factor reducing the shrinkage. Use of a complex FVd10A3 vanadium master alloy in making grade 45FL steel allows reducing the cost of alloying by 2-2.5 times as compared to ferrovanadium, and also reducing the consumption of ferroalloys (ferromanganese and ferrosilicon) and aluminum. When using the master alloy the loss of vanadium is reduced by 30% in comparison with use of ferrovanadium. The master alloy dissolves and gets assimilated well in liquid metal and can be added directly into the ladle, which enhances its effectiveness even more. In 2005 a total of 1,700 tons of good castings from grade 45FL steel were produced using the FVd10A3 master alloy. Use of grade 45FL steel instead of grade 45L to cast tractor chassis system parts (driving and guiding wheels) allowed improving their wear resistance by 1.3-1.4 times and reducing by 20% the number of parts' failure during the warranty period of tractor operation. The work is aimed at higher efficiency of "Autoforge" dies that are produced at Kamsky Automobile Plant from heat-resistant grade 4Х5МНФС steel. To reduce die production costs and increase their life time, there has been developed a method of producing a bimetallic die based on grade 20Х15Н18ТЗМОБР steel having higher performance characteristics. Reduction of expensive steel consumption with a higher cooling efficiency has been achieved by using aluminum as a heat-removing layer. Mechanical properties of the bimetallic die and distribution of alloy components in the bimetallic layer have been investigated. 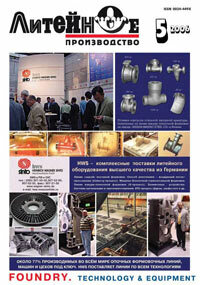 Dependence of mechanical properties of the die on the rate of cooling the alloy being produced has been revealed. Expediency of using liquid nitrogen in the crystallizer cooling system has been established. Using the basic laws of classical hydraulics, operating flow parameters in the centrifugal force field have been determined. Conditions of formation of enforced flow behavior in the channels of spinning gating systems are shown. Consumption coefficients of typical, (basic) gating systems of molds spinning around horizontal and vertical axes have been determined. Based on the results of the investigations, recommendations are given for constructing and designing gating systems of spinning molds. Issues of vitrification of petrurgical melts during their cooling are discussed. Based on neuronet analysis, interrelation between the chemical composition and vitrification temperature has been established allowing prediction of standard vitrification temperatures for alloys with different chemical compositions. Methods of determining the critical cooling rate is proposed, by which such rates for four alloys with different chemical compositions have been determined. The established interrelations and proposed methods of calculating the critical cooling rate allow determining optimum cooling rates of alloys and regulating the crystallization processes in stone casting.